Weekly insight into the world of drinks with Paul Clarke from the Cocktail Chronicles and Imbibe magazine. "It has a more gentle, floral anise flavor." In 1934, just after the end of prohibition, a New Orleans pharmacist named J.M. Legendre introduced a product designed to appeal to that city's residents' long-time taste for the anise-flavored absinthe, which had been banned in 1912. Dubbed "Legendre Absinthe," the spirit—which, contrary to the label, was not an actual absinthe, but rather a wormwood-free substitute—quickly drew the attention of a disapproving federal government, who required him to change the name. Re-released as Herbsaint, the potent spirit has been produced ever since. Except, as Florence Fabricant recounts this week in the New York Times, a few things have changed over the years. 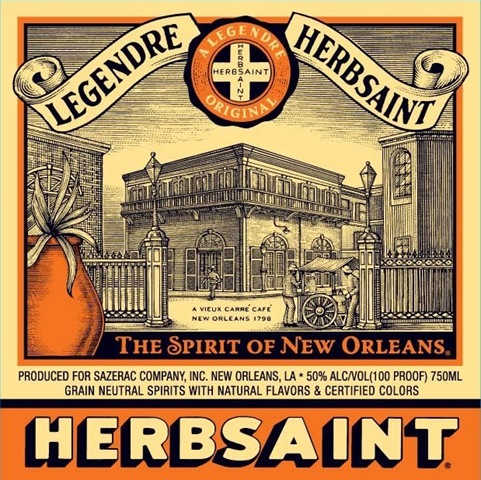 A favorite in cocktails such as the Sazerac, Herbsaint was sold to the Sazerac company (makers of Peychaud's bitters and other spirits) in 1949, and its formula was adjusted, making the product a lower 90-proof and the flavor a heavier hit of oily star anise. The recent return of absinthe to the market has renewed interest in the early Herbsaint, and with assistance from Houston-based Herbsaint collector Jay Hendrickson (profiled by Robert Simonson in the March/April issue of Imbibe), Sazerac is releasing a version of Herbsaint made from the 1930s formula, complete with a label based on the original. I had a taste of this new-but-old formula in New Orleans last summer, and came away impressed. Like other absinthe substitutes such as Pernod and Ricard, the current version of Herbsaint (which will remain on the market alongside the vintage replica) has a flavor that's heavy with star anise (which closely resembles black licorice) though Herbsaint also has a sharp, crisp finish, making it a useful cocktail ingredient. The vintage-styled Herbsaint, however, has a more gentle, floral anise flavor mixed with an herbaceous complexity, and bottled at 100 proof, it offers a more potent delivery of flavor that could prove especially useful in New Orleans classics such as a Cocktail a la Louisiane. Absinthe is now a staple in my liquor cabinet for many such drinks, but with a flavor that's strikingly similar to classic absinthes and at less than $40 a bottle, this Herbsaint replica has earned a spot at the bar. Paul Clarke blogs about cocktails at The Cocktail Chronicles and writes regularly on spirits and cocktails for Imbibe magazine. He lives in Seattle, where he works as a writer and magazine editor.